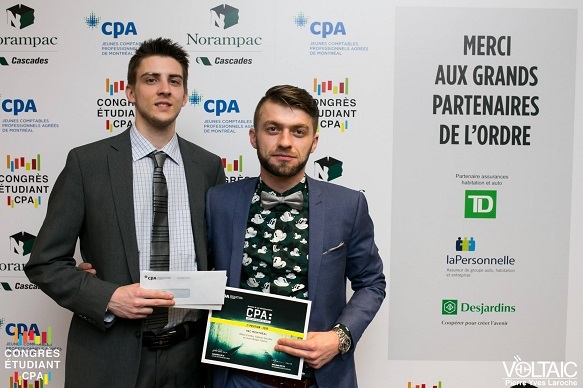 A number of BBA students from HEC Montréal were rewarded for their performance in accounting at the CPA student congress held in Wendaka from March 11 to 13. First off, the HEC Montréal CPA student committee came in second as committee of the year. Students Mihai Ciorba, Gabriel Paradis and Juan-Roger Saulce also placed second in the interuniversity case competition, Une affaire de cas, held in January. Close to 200 students from 13 universities took part in this fourth CPA student congress. This year’s event was organized by a group of Université Laval students in co-operation with the Ordre des CPA du Québec. The HEC Montréal CPA student committee, second as committee of the year: Mathieu Laforest, Élisabeth Brault, Stéfanie Bernard, Mihai Ciorba, Antoine Bussières, Joannie Marcoux-Clément, Jean-Sébastien Landry, Chloé Paquette and Sophie Lauzon. Photo: Nicholas Belliveau Photography. Gabriel Paradis and Mihai Ciorba, who took second place in the interuniversity case competition, with Juan-Roger Saulce (absent). Photo: Voltaic.